Now that temperatures are dropping (or have dropped — I see you, Minneapolis) into their winter depths, shiverers across the country are fighting back with puffy down coats. Unfortunately, the very jacket responsible for saving sanity is also responsible for promoting animal cruelty. Down — real down — is inimitable when it comes to warmth, lightness, and comfort. The fake stuff doesn't cut it. Thinsulate doesn't cut it. And never leaving the house if the temperature is below 35 degrees — while a tempting lifestyle choice I'd love to have the luxury of making — isn't feasible. In order to exist north of the 40th parallel, at one time or another, a person needs a down coat or an elaborate sweater/vest/Carhart concoction worthy of an Arctic oil rig. Unfortunately, to borrow from Salon's Marie Myung-Ok Lee, down doesn't grows on trees. It grows on birds. Birds that are alive. Down isn't the top layer of feathers, either; down is the soft, puffy underfeathers. And triple unfortunately, obtaining those feathers from the birds that grew them often requires purveyors of the down that fills your comfy puffer coat to pull the feathers out of the bird. While the bird is alive. Down is often collected through a procedure called live plucking. 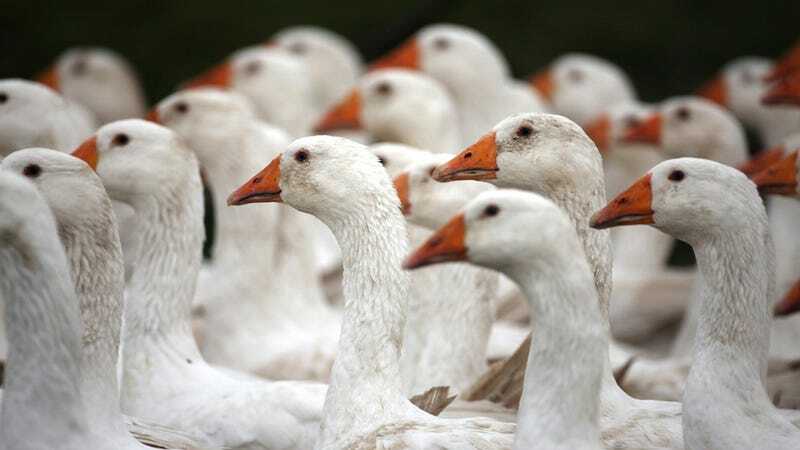 Which is pretty much what it sounds like: A worker restrains the bird and rips out feathers by the handfuls, especially from the goose's underbelly but sometimes also from the back. Often, pieces of skin come off as well, the birds scream in terror and struggle to get away. Sometimes they die from the trauma. But surely not my down coat! you might think, hopefully. Sorry. Odds are, it was pulled out of an alive thing; according to estimates, more than half of the world's down supply is live-plucked. And North Face, despite claims that it's working to humanely sourced down (that's down that's plucked from geese that have already been slaughtered for meat), still gets most of its feathers from a company that imports from live-plucking suppliers. What about synthetic down? Just going to interrupt you right there — that's a petroleum byproduct, so fake down is killing everything. So, to review: everything that will keep you warm is at the expense of the pain of another living creature. Life is cruel and survival depends on merciless consumption of other living things, and modern life has insulated us from the truth of that brutality. Either that, or human beings aren't meant to live in places that get cold enough to wearing tights under pants.